Emma-Rose Gibson can see clearly no more than three centimetres in front of her, but a new device is allowing the nine-year-old Ottawa girl to watch TV. 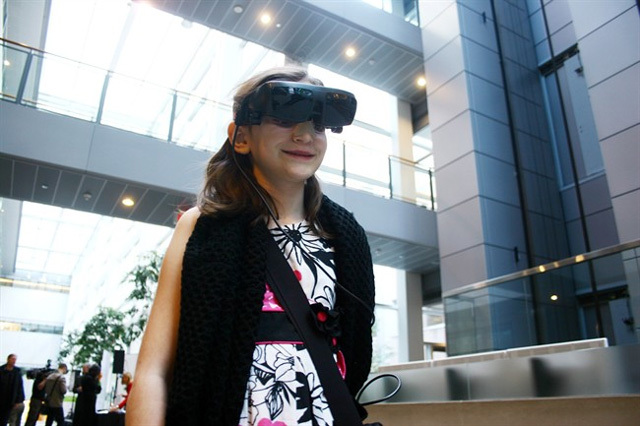 The legally blind Grade 4 student, who is diagnosed with optic nerve hypoplasia, is one of the first users of the eSight eyewear, a pair of computerized glasses officially launched Tuesday in Toronto. The device — made by Ottawa-based eSight Corporation — ​ reconfigures images captured by its high-definition camera in a way to optimize a user's vision. The processed images are then fed into two LED screens in front of the user's eyes. Gibson, who has been using the device since May, said it allows her to participate fully in class and grants her a degree of mobility she didn't have before. When I first heard of it, I was like, 'Wow, this can actually change my life,"' she said. "I went from just seeing nothing to seeing everything in my classroom. The president and CEO of eSight said the eyewear is mostly software-based, and can be easily upgraded over the years. "ESight is mobile, hands-free, and can automatically process near, far and mid-range vision tasks," Kevin Rankin said. John Rafferty, the president of the Canadian National Institute for the Blind (CNIB), attended Tuesday's launch. "It's an exciting device that can enable some people to recapture activities they haven't experienced in decades, like watching their kids play soccer or reading the Sunday morning newspaper," he said. But Rafferty said the eyewear — which costs about $10,000 — still relies on the wearer's sight, and is designed to help those with partial sight, and not the completely blind. According to CNIB, legally blind is defined as worse than or equal to 20/200 vision with correction -- a legally blind person six metres in front of an eye chart sees what a person with normal vision sees at 60 metres. In Canada, vision worse than 20/50 with correction disqualifies people from obtaining a driver's license or restricts their driving to daytime only. "What we're doing is optimizing that remaining sight," Rankin said. "A lot of the diseases types we work with, the eye conditions can't be improved by drugs or surgery." Development of the device was made possible with financial support from the Investment Accelerator Fund, which is funded by the Ontario government and provides up to $500,000 in seed funding to Ontario-based technology companies.